Although planning a vacation in Thailand sounds exotic, expensive, and potentially out of reach, getting there is easier than you think! Bangkok often ranks as the most visited city in the world for a reason: Thailand is a beautiful, affordable destination — even for two-week trips. Each year, millions of travelers enjoy a vacation in Thailand without spending a fortune or backpacking for months. How Much Will a Trip to Thailand Cost? Forget the long-standing myth that faraway places are accessible to only the wealthy or retired. 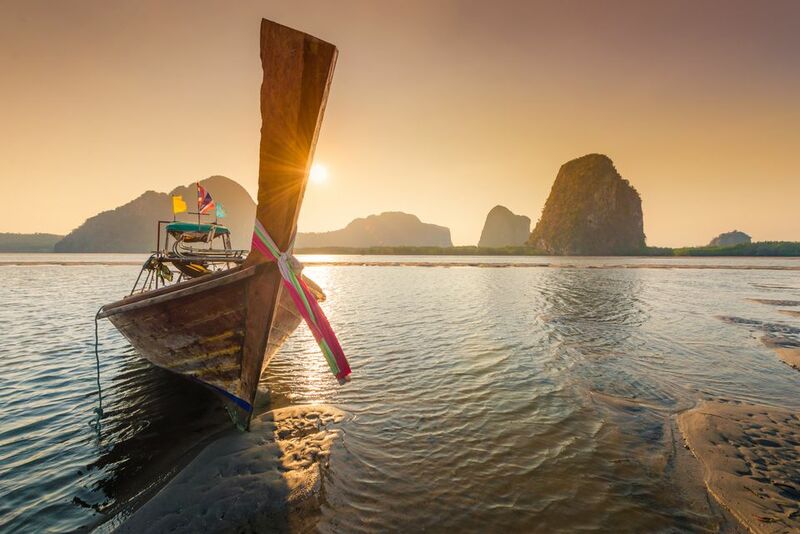 A vacation in Thailand can be as inexpensive as a trip to California, Hawaii, the Caribbean, or any of the other usual top destinations for Americans. It may even cost less, or at the least, you'll get nicer rooms and more memorable experiences for the same amount of money spent. A large number of Thailand's annual international arrivals are backpacking budget travelers who get by on less than US $900 for a month in Southeast Asia. You may opt for a bit more luxury on a shorter trip. The good news is that tourism is well developed in Thailand; you have choices. You can find beach accommodation for $10 per night (bungalow with fan) or $200 per night (five-star hotel) — the choice is yours! Airfare is obviously the largest upfront cost. But finagling a deal is possible with a little trickery. Use domestic carriers to get yourself to LAX or JFK, then book a separate ticket to Bangkok. Splitting a ticket between two carriers could save you hundreds of dollars! Once on the ground in Thailand, the exchange rate and lower cost of eating and drinking can quickly compensate for the cost of the airfare. Take a Tour or Plan an Independent Trip? Although organized tours in Asia may seem the quick-and-easy solution, you can save money by just organizing transportation and activities once you are already on the ground. Research activities you want to do, however, there is no real need to book them online or before arriving in Thailand. Booking day trips and activities is very easy in Thailand. Unless you go far off the beaten path, the language difference won't present any problems. Pretty well everyone who works with tourists will speak good enough English. You'll find numerous travel agencies in tourist areas. Simply walk in, tell the person behind the counter where you want to go, and minutes later you'll be holding a bus/train/boat ticket. Commissions charged are trivial. The reception desk at your hotel or guesthouse will gladly book tickets and activities for you. For activities, you'll usually be collected at your hotel by someone from the agency on the morning of your tour. Travelers are consolidated then taken on the day trip. At the end of the day, you'll be returned to your hotel — easy! Weather differs a little between regions, but generally Thailand's driest months are between November and April. Even during the low/rainy season in Thailand, you'll enjoy days of sunshine. Discounts for activities and accommodation are easier to negotiate during the low-season months. You may wish to time your vacation in Thailand around one of the many big festivals. At least make sure that you are aware one is coming — missing an exciting event by just a day or two is very frustrating! The big Full Moon Party each month will affect transportation to and from the Koh Samui Archipelago (especially Koh Tao and Koh Phangan). Planning an itinerary around moon phases may sound a bit pagan, but you'll be glad you did! Do You Need Vaccinations for Thailand? Although no specific vaccinations are required for Thailand, you should get the general ones recommended for all international travelers in Asia. Hepatitis A and B, typhoid, and a Tdap (for tetanus) are the most common jabs international travelers go for — all are good investments and provide protection for years. You will not need rabies, yellow fever, or Japanese encephalitis vaccinations for a regular vacation in Thailand. The same applies for anti-malarial drugs. There is a relatively low risk of contracting malaria in Thailand, especially if you aren't spending extended amounts of time in the jungle. The biggest risk in Thailand is dengue fever. Until the new vaccination being tested becomes available widespread, your best defense is to do what you can to avoid mosquito bites. Zika (another mosquito-borne illness) is not a serious threat in Thailand. With expansive malls in Bangkok and outdoor markets in Chiang Mai, along with plenty of smaller open-air street markets between, you'll have no shortage of cheap shopping opportunities. Leave room in your luggage: you'll definitely want to take home some unique finds! Pack less clothing and plan to buy an outfit or three there. Rather than doing a lot of shopping before your vacation in Thailand, plan to purchase items locally to help merchants who need the income more than Western CEOs. Why carry an umbrella 8,000 miles if you can buy one there for $2 if it rains? There are a few things you'll want to bring from home for your trip to Thailand. But beware of the biggest mistake most travelers in Asia admit to making: packing too much. ATMs are literally everywhere in Thailand; they often compete for space! That's because providing cash to travelers is business: fees have skyrocketed to US $6-7 per transaction (on top of whatever your bank charges). When using ATMs in Thailand, request the maximum amount each time. Sometimes breaking large denominations can be a challenge. Experienced travelers know to ask for 5,900 baht rather than 6,000 baht — that way they get some smaller denominations, too. For instance, if you request 6,000 baht from an ATM, you'll receive six stiff 1,000-baht banknotes. Breaking them in small shops and eateries may produce some groans from the staff. Paying with them at carts for street food is simply rude. Instead, ask for 5,900 baht at the machine and get five 1,000-baht notes, one 500-baht note, and four ever-useful 100-baht notes. As usual, exchanging U.S. dollars is an option. Mastercard and Visa are widely accepted at malls and larger hotels/restaurants, however, you may be charged an additional commission when paying with plastic. Identity theft is a growing problem; opt to pay with cash when possible to minimize risk and transaction fees. Haggling is a part of Thai culture, and you should bargain playfully for purchases such as souvenirs and clothing. Prices are even flexible in shopping malls. Accommodation and activities can often be negotiated, but always keep in mind the rules of saving face. Never haggle for food, drinks, or items with standardized prices. Tipping is not the norm in Thailand, although there are some rare exceptions. Even if your intentions are good, leaving a tip accelerates cultural mutation and inflates prices for locals. Doing so causes people to prefer serving tourists (because they sling money around) over locals who may be more frugal. For large purchases made on your trip, you can request a GST refund at the airport as you exit Thailand. You'll need to have receipts and paperwork. Prices displayed always include tax. At the register, you'll pay the price that was displayed. Sometimes a 10 percent service charge may be added to restaurant bills. Most travelers arrive in Bangkok, but there are plenty of beautiful destinations farther afield. The Thai Islands: No Thailand vacation is complete without visiting at least one or two of the beautiful islands. All differ in personality and allure. The shape of Thailand means choosing between some great island options in the Andaman Sea (west side) and the Gulf of Thailand (east side). Chiang Mai: Thailand's northern capital is a favorite for many visitors. Life within the Old City is more manageable and easier to get around than Bangkok. The vibe is inarguably different and pleasant. Good food, outdoor markets, Lanna culture, and $6 massages are all great reasons to grab a low-cost flight or train from Bangkok to Chiang Mai. Pai: Located around four hours north of Chiang Mai and surrounded by green hills, Pai has transformed in recent years from a quiet, "hippie" village into a major tourist destination. Despite the extra visitors, Pai retained much of its riverside charm. Organic farms and food, surprisingly good nightlife, and yoga/holistic/healthy workshops are all great reasons to visit. Northern Thailand provides many other draws in the area as well. Ayutthaya: Just a two-hour train ride north of Bangkok, Thailand's former capital is the place to enjoy culture and cycle through ancient temple ruins. You'll often be the only person in a centuries-old temple! Railay: Thailand's rock climbing epicenter in Krabi isn't just for climbers anymore. The impressive limestone scenery is unlike any other. But even if you prefer feet on the ground, the powdery sand and isolation (Railay is only accessible via boat) will make you feel as though you're on an island. The tourism infrastructure in Thailand is well established. They've had a lot of practice accommodating visitors of all budgets and trip durations. But as with many top destinations, things are creeping decidedly upscale as older, mom-and-pop businesses are demolished and replaced by foreign-owned chains. Thai food is celebrated around the world for its savory flavors and spicy potential. But forget the myth that all Thai food is spicy — most restaurants (especially the ones catering to tourists) will ask how much pain you can handle or allow you to add your own spice. Chili powder is usually available on every table. Fun nightlife is widespread in Thailand. The cost of a large domestic beer averages $2 – 3. From epic beach parties to drinking sessions with locals, only a few specific areas are as seedy as is often depicted on television. Thailand is a Buddhist country. You will inevitably end up encountering monks and visiting impressive temples. Don't expect Hollywood's depiction of a Buddhist monk: the Theravada monks in Thailand often have smartphones! Thailand is a very safe destination. Crime, aside from the usual petty theft, is rarely ever a problem for foreign visitors. Tourism is big business, and Thais will often go out of their way to help you enjoy their beautiful country. Enhance your trip by learning how to say hello in Thai before you go. Locals are patiently tolerant, however, you should know a few dos and don'ts in Thailand to avoid being "that" tourist who accidentally ruins a good thing! Assuming you departed from North America, circling the globe to Asia will consume a full day (each direction) of your vacation time. Also, jetlag bites harder; the time difference between Eastern Standard Time and Bangkok is +12 hours. Major attractions get very busy during the dry season months (November to April). Traffic in Bangkok is worse than ever. Although crime isn't bad, there are a number of individuals who make livings by scamming tourists.